Happy Halloween! Today is a day centered around ghosts, goblins and—let’s face it—candy. But the holiday doesn’t have to be all about a sugar rush followed by an even more intense sugar crash. 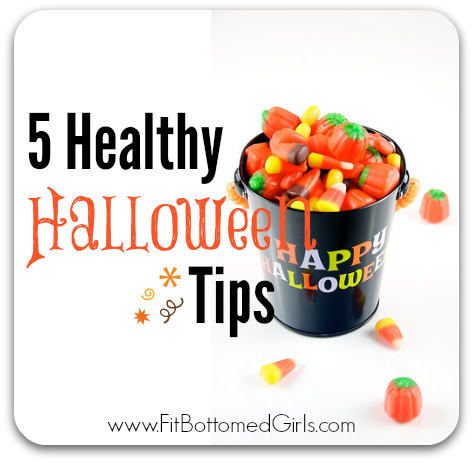 Follow our top five tips for a happy and healthy Halloween! 1. Use Halloween colors as inspiration. If you really want to get into the Halloween mood, try to eat mostly foods that are colored orange and black (or purple—nature’s closest version). Whether it’s snacking on raw carrots, making a chopped salad with purple cabbage or making these Halloween-themed fruit pops, you can enjoy plenty of Halloween eats that don’t involve tons of sugar. And no, candy corn doesn’t count as a vegetable. 2. Jam with your bad self. There’s nothing like a few Halloween-tastic tunes to get you moving and grooving. Not only does a little of Michael Jackson’s “Thriller” set the tone for the day, you also might be inspired to get up to burn some calories. And if you’re planning to hit the gym today, be sure to listen to this Halloween-themed workout playlist! 3. Embrace your inner fitness icon. Be healthy both in costume and not! Whether you go as one of these fabulous fitness-inspired costume ideas or as a Fit Bottomed Girl (how easy is that? ), you’re sure to have an extra healthy Halloween. 4. Laugh! If No. 3 wasn’t enough to get you giggling, try this video of parents scaring the crap out of their kids. Whether you’re a mom or not, we guarantee you’ll bust a gut. Which is a good thing. And definitely something healthy to do on Halloween! 5. Enjoy mindfully. Who are we kidding? Of course you’re going to indulge—it’s Halloween! Just be sure that when you do, it’s a conscious decision and you enjoy every damn bite. (Instead of hiding in the kitchen, quietly unwrapping bite-sized candy bars—as if the noise itself is what packs in the calories.) After all, that’s what the holidays are really about—having a good time! Love the idea of infusing the holiday spirit in with your fitness routine. This past weekend, I loaded up the MJ on youtube and did some at-home “aerobics” myself. To add to your list of tips, I’d recommend being careful about the Halloween candy portion sizes. As you girls mentioned in your other post about candy calorie count, the small size can be deceiving if you don’t keep your wrappers in check. It might not seem like it, but suddenly, you’ve gone through 4 or 5 hundred calories–candy packs a powerful punch! The upside? If you’re able to fight the temptation to go back to the bag, the smaller chocolate size means you can carefully indulge in your favorite Halloween treat; you can reasonably have one, two, or even three different treats, depending on how many calories you want to rack up. One last tip for all you chocolate lovers out there: if you feel especially vulnerable to all the leftover candy post-Halloween, just keep right on givin’ it out. Parcel out the excess treats to co-workers, friends, or even those teens who babysit your kids. Point being, if you’re trying hard to resist the post-Halloween temptation, get it out of the house! For those with stronger willpower, you can opt to tie up the candy bag and keep it out of sight, instead of sitting in a bowl on the counter. The more available the temptation is to us, the more likely we’ll be to indulge.